Coachella is just a couple short weeks away and with that, music festival season is here! Whether you’re camping for a weekend full of music and memories, or it’s a one-day affair, you’ll have to think ahead when it comes to your makeup. Dancing, partying, and running from stage to stage means you’ll have to festival-proof your makeup to make sure it lasts through every artist. You all know me— I don’t like reapplying or fixing my makeup a lot during the day, regardless of where I am. But especially during a festival, where there are limited opportunities to touch up, it’s all about long lasting products that make a statement. These favorite drugstore festival makeup won’t fail you, and will help you stay insta-worthy all day and night. Here’s my list of my favorite long lasting makeup to wear to festivals. Click the photo of the product to find it online! I wear this when I know I’m going to be sweating. It helps mattify while giving me a smooth base for my foundation to stick to. This foundation has definitely grown on me. Its definitely matte— so if you already lean dry it might not be the best option, but if you’re normal to oily, it’s a dream. Not only do you get a long-lasting wear that keeps shine at bay, but you’re getting near full coverage and even canvas for the rest of your look. This one’s new in my collection but I love the texture! This eyelid primer dries down so it’s easy to blend shadows on top of it, and helps your shadow hang on all day. This brand new fesitval-inspired eyeshadow palette has bold pops of color and reliable neutrals with a mix of shimmers and mattes, so you can create every look possible! The shades are high-impact and the mirror inside will also help you complete your routine. My go-to eyeliner for literally everything, but especially when I want my liner to be on point all day. No flaking, no fading, no smudging. Just deep black matte goodness that’s easy to apply with a thin brush tip. This is a go-to mascara of mine for huge, luscious lashes. I prefer wearing waterproof mascara to festivals because I’m usually sweating, and the formula won’t smear or run. Ya’ll know this is one of my favorite drugstore contour palettes, and the formula is very lightweight which is important when you’re going to be running around in the heat. Festival makeup always makes me think — “see my highlight from space!”. If you haven’t tried this drugstore highlighter from e.l.f., you’ve got to! It gives off such a strong and long-lasting glow (especially when applied wet) that it has to be part of your festival makeup look! One of my most surprising finds from my Shop Miss A haul was this blush from Amuse, which lasted a hell of a long time for a $1 blush. I love the shade Dusty Rose, and it’ll compliment a ton of different looks. 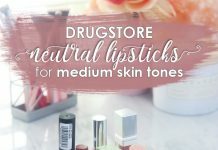 Pretty much the most long lasting lipstick at the drugstore, this one will survive most of what you throw at it. With the bolder shades I may have to touch up in the middle after eating, but it’s going to stay looking fresh for hours. Setting spray is a must when you want to extend your makeup wear time and also freshen up. It’s something I will bring along with me into the festival to cool down while reinforcing my makeup. The Milani Make It Last spray is actually a multi-purpose product that can also prime your makeup, so you can cut down on the products you bring! 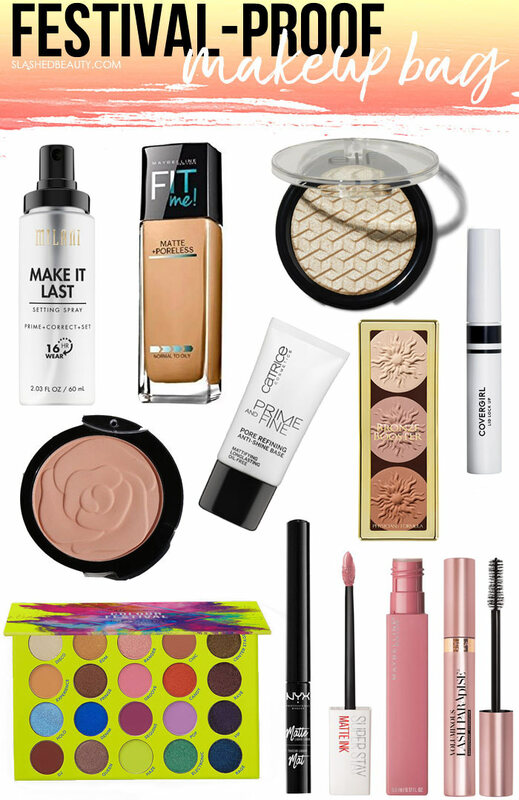 Do you have any festival makeup favorites that will survive the fun? I need to try Matte & Poreless. I don’t know why I never have! It seems silly, now that I think about it. It definitely had to grow on me– make sure you’re moisturized well because if your skin is dry, it will show. But now that I’ve been better about moisturizing, it looks great!